If you’ve been to The Dubai Mall or Dubai Fountain recently, you might have noticed that a huge floating installation has appeared above a section of the Dubai Fountain on the waterfront promenade. The stunning woven sculpture, ‘1.78’, is making its UAE debut against the dramatic backdrop of the Burj Khalifa and the Dubai Fountain. 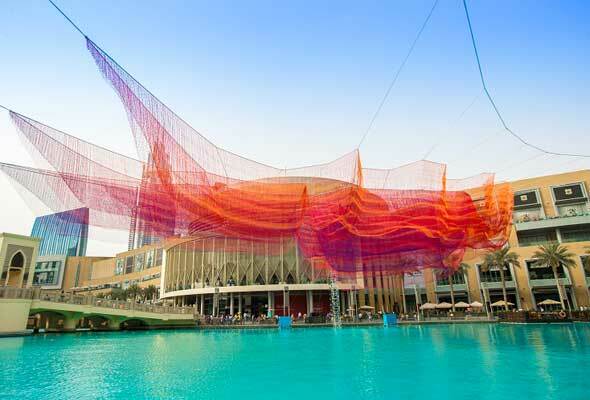 The piece, by American fibre artist Janet Echelman, comes to Dubai after a recent stint in Madrid’s Plaza Mayor. The newest addition to Echelman’s Earth Time Series, ‘1.78’ is made up of layers of bright polyethylene threads tied in over 600,000 knots over nearly 124 kilometres of string. The layers of engineered fibre are extruded in vibrant hues then braided, knotted and spliced together to create a volumetric form which changes shape with the wind and weather. It’s also well worth a visit at night, as it comes to life with a kaleidoscope of projected coloured lights. Designed as ‘an exploration of cyclical time’, ‘1.78’ refers to the number of microseconds that, according to NASA, the day was shortened when a single physical event shifted the earth’s mass, thus speeding up the planet’s daily rotation. The installation is the latest in a series of artworks which have been showcased at The Dubai Mall, following on from Richard Hudson’s ‘LOVE ME’ public sculpture and ‘Wave-Field’ – a travelling exhibit by Canadian-based Lateral Office and CS Design.